All in a hard days play… The snowfields on Mt Buller are vast and varied from gentle beginner slopes to spectacular double black diamond chutes and there’s also a fantastic range of intermediate runs. The lift system is one of the most advanced in the country with a total of 25 lifts including, 13 chairlifts this means less times in queues and more time out of the slopes. Our grooming fleet is 15 strong providing smooth corduroy each morning of most of our runs. Our snowmaking system has the highest capacity in Australia – Mt Buller can make more snow more often providing some of the most reliable snow around. Skilib Accommodation Mt Buller is conveniently located within a 100 metres of the Chamois ski run, site of the world aerial championship, and Saturday night explosive jump demos! Whether you’re just starting out or you’re a seasoned expert who can navigate the steepest slopes with ease, you’ll get more out of your holiday if you ski the runs that are best suited to your level. At Mt Buller there is a variety of terrain to suit every ability. 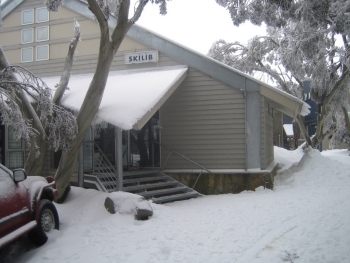 Skilib provides all the facilities you need to make your stay at Mt Buller an enjoyable one, including a ski room to store your gear, and a drying room to dry out your clothing, ready for the next day. Beginner (Green) Runs: You’ll start out on the famous Bourke St which is the perfect length and pitch for beginners making their first turns and learning to stop. At the top of Blue Bullet 2 is Baldy offering a new challenge to beginners wanting to test their skills. For those wanting to explore a little, head to the top of BB2 and following the signs to Spurs from where you can access Burnt Hut Spur (our day tripper beginner area). Intermediate (Blue) Runs: The ever popular Little Buller Spur offers skiers the most reliable and consistent skiing experience. You can access Little Buller Spur from the top of BB2 then follow the signs to Little Buller Spur located on the Southern Slopes, Little Buller Spur offers a wide cruising slope that leads to the Wombat Chair. A great alternative to LBS is Wombat which runs parallel and leads to the Wombat Chair. Other popular runs on the Southside for intermediates include, Standard, Playground, Family Run and Summit. On the Northern Side of the mountain Summit Slide and Dam Run are great choices. Advanced (Black) Runs: Federation is a favourite for the experienced skier and in great conditions you can’t get much better. The varied terrain continually challenges the experienced skier. Most advanced runs are located on the Southern Side of the resort. In addition to federation other popular choices are, Howqua Extension, Men’s and Women’s Downhill and the Buller Run Bowl. On the Northern side there’s Ridge Run and Cow Camp and…if you’ve still got the energy and you’re up for adventure head for the Chutes of the summit (only for the expert of experts! ).